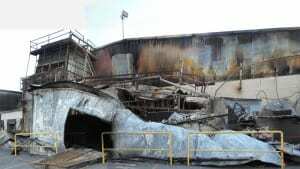 Haunted by images of the wildfires that devastated hundreds of thousands of acres of forest land in the Chelan and Okanagan regions, a group of Bainbridge Island artists and musicians have banded together for a benefit performance and auction to raise money for wildfire relief. 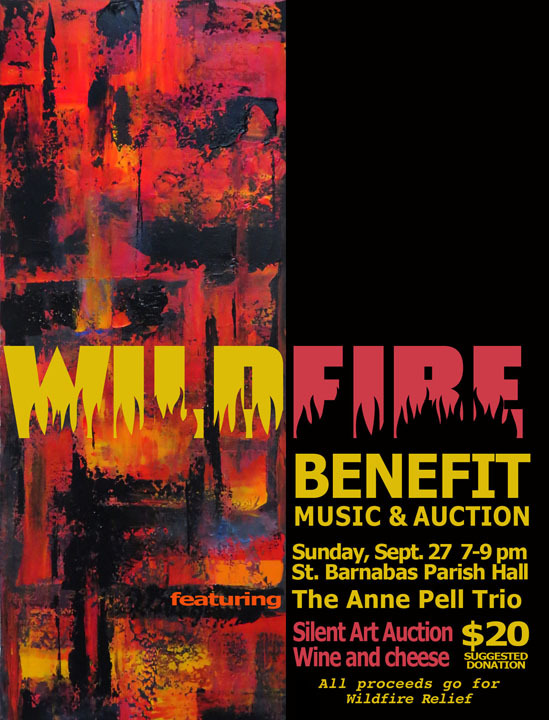 The Wildfire Benefit, to be held this Sunday, September 27, from 7 to 9 pm at the St. Barnabas Parish Hall, will feature a silent auction of works by local artists, music by the Anne Pell Trio, information about the wildfires, and a brief update from the Bainbridge Island Fire Department, which sent personnel to help fight fires in the Chelan region. Artists who have donated work for the silent auction include Mary Agrell Stroeing, Hilary Goldblatt, Paul Brians, Victoria Foster Harrison, Gillian Bull, Diane Walker and Dion Zwirner. A book donated by Eagle Harbor Books and a quilted table runner from the Mongolian Quilting Center will also be auctioned off. Wine from Rolling Bay Winery will be served with light hors d’oeuvres, and there will be a suggested donation of $20. 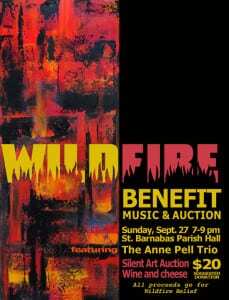 All proceeds from the evening will go to the Chelan Valley Wildfire Relief Fund. Credits: BCB host: Channie Peters; audio editor: Chris Walker; publisher Diane Walker.